DST Tech Team Professional Development? 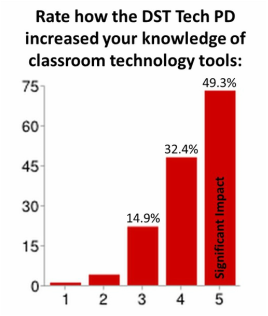 At the conclusion of an ongoing professional development series, participants completed a short survey. 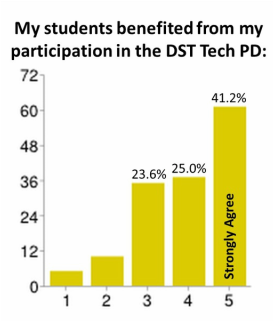 The DST Tech Team will use the evaluative data about the delivery and implementation of the training to make better data-driven decisions about future technology support in schools. School leaders and DST coaches were provided with details data on their schools and a synthesis of the responses, including the anecdotal data and comments. View the participant survey HERE. More data can be found on the infographic below. 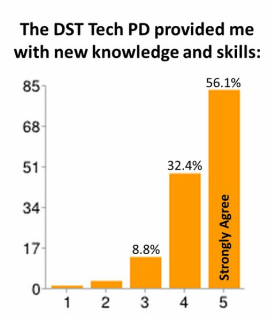 The DST Tech Team will focus on supporting teachers' utilization of the knowledge and skills in their classrom to impact student learning. Click HERE to view this infographic in a separate window.